Talos drinking his soda is a direct reference to Pulp Fiction. 1. 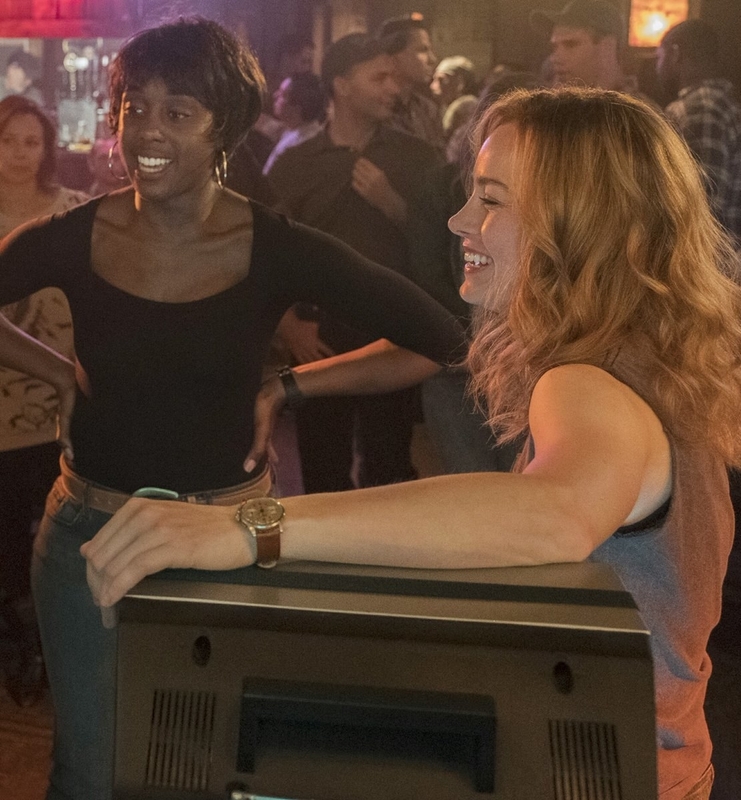 First, Stan Lee's cameo in Captain Marvel involves him reading the Mallrats script on a train — meaning that Mallrats and Stan himself exist in this universe. 2. 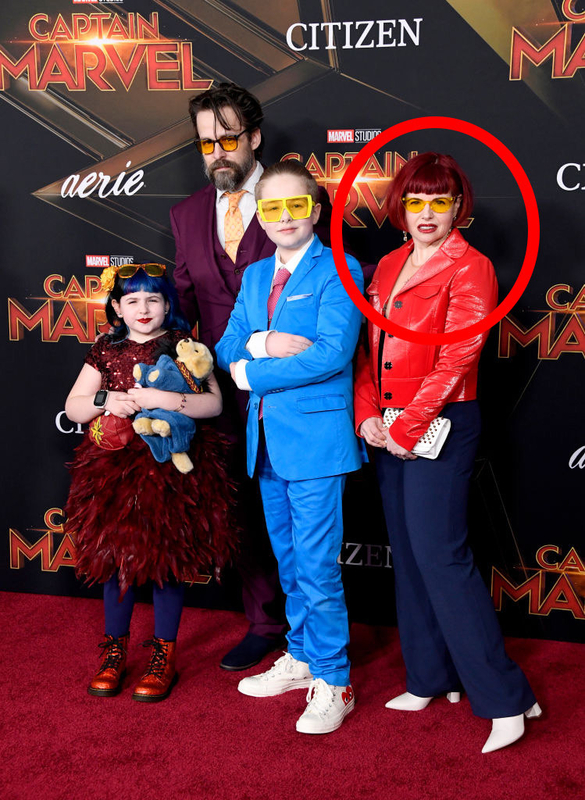 Also during Carol's high-speed Skrull chase, she bumps into Kelly Sue DeConnick on the platform — Kelly is responsible for turning Ms. Marvel into the Captain Marvel we know today. 3. When Carol crashes into the Blockbuster, she blasts a cardboard cutout for the movie True Lies starring Jamie Lee Curtis and Arnold Schwarzenegger. Carol obliterating the cutout could also be a nod to True Lies star Eliza Dushku, who spoke out against the film's stunt coordinator and revealed he sexually assaulted her while on set. 4. Also in Blockbuster, Carol picks up a VHS copy of The Right Stuff, which is about Navy, Marine, and Air Force test pilots. 5. You can also spot a copy of Hook on the shelf behind her. 6. Talos drinking a soda after breaking into Maria's house is a reference to Samuel L. Jackson's character in Pulp Fiction. 7. 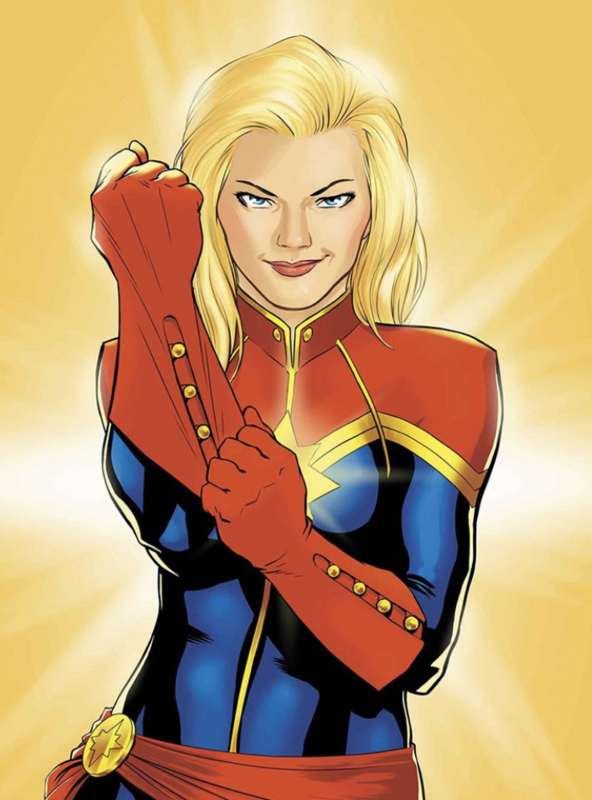 When Monica is changing Carol's suit's colors, she briefly changes them to green and white, which were the original Kree colors in the comic books. 8. When Carol is making a phone call to Yon-Rogg in the parking lot, you can spot a Smashing Pumpkins's Mellon Collie and the Infinite Sadness poster and several "Rock the Vote" posters. 9. If you look closely, each member of Starforce actually has a different star design on their Kree uniform. 10. 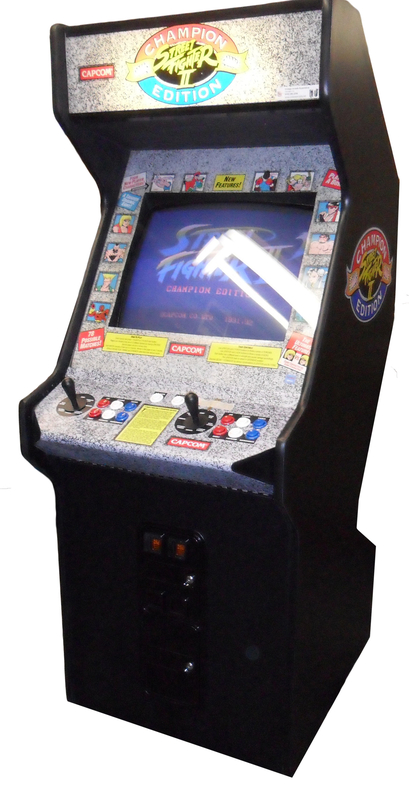 The game that Carol can be seen playing in Pancho's bar during a flashback is Street Fighter II. 11. Due to the fact that Captain Marvel is a prequel, there are some details that link back to previous MCU movies — for instance, in The Avengers, Bruce Banner jokes about swallowing the Tesseract, like Goose does. 12. 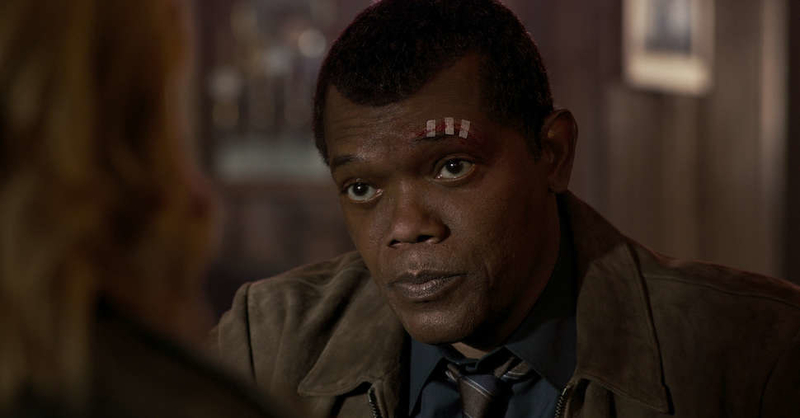 There's also the theory that Nick Fury could be a Skrull because he was seen cutting a piece of bread diagonally in Age of Ultron — of course, in Captain Marvel we learn that Fury hates his toast cut that way. 13. Dr. Wendy Lawson's Project P.E.G.A.S.U.S. was actually mentioned in Iron Man 2 when Tony asks Jarvis for info on it. 14. Also, the Project P.E.G.A.S.U.S. bunker from Captain Marvel is similar to the one seen in The Avengers when Loki steals the Tesseract. 15. Fury losing his eye to Goose is even funnier when you remember that in Captain America: Winter Soldier, he said that the last person he trusted caused him to lose his eye. 16. 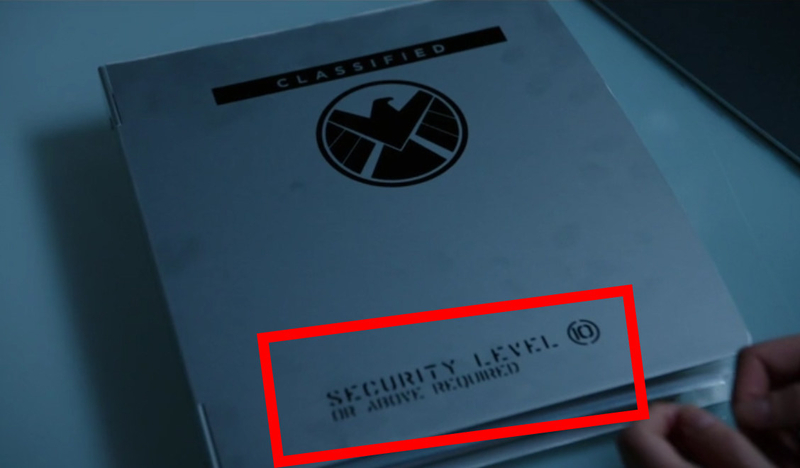 Fury's S.H.I.E.L.D. identification card shows that he has level three clearance — in present day, Fury has level ten clearance. 17. This is another theory, but it's too cool not to mention: Some fans think that the shooting star that Carol and Monica see in one of the flashbacks is actually Peter Quill shooting off to space. If you map out the timeline of events, Quill was picked up in 1988 and Carol had been missing for 6 years in 1995. 18. Just to make you cry over Carol and Monica's adorable relationship even more, in the comics, Monica uses the Captain Marvel mantel and becomes the leader of The Avengers. 19. In a flashback, you can see that Maria's callsign while in the Air Force was "Photon." Monica also uses the codename "Photon" to fight crime in the comic books too. 20. Of course, we learn that Dr. Wendy Lawson is actually Mar-Vell from Kree, but in the comic books, Mar-Vell was actually a guy and he's the first person to use the superhero identity Captain Marvel. 21. In the comics, Torfa, the planet where the Skrulls take refuge, has a toxic atmosphere caused by Vibranium — one fan pointed out that maybe Torfa is where the meteor that struck Wakanda originated from. 22. On Agents of S.H.I.E.L.D., Fury revives Coulson the same way Yon-Rogg says he revived Carol — a transfusion of Kree blood. 23. And finally, the dedication that appears in the Captain Marvel credits is for Major Stephen 'Cajun' Del Bagno, who passed away in 2018 — Del Bagno was one of several Thunderbirds who helped Brie Larson prepare to play Carol. Did you notice any Captain Marvel details or Easter eggs? Tell us in the comments below!